On this World Religion Day, an international observance dedicated to interfaith dialogue begun by American Baha’is in the late 1940s, I’d like to spotlight Protestant-Catholic relations in two locations in the United States where a branch of my family once lived. The first is Fitchburg in northern Worcester County, Massachusetts, where the first Catholic church in that part of the commonwealth was built in mid-1800s. 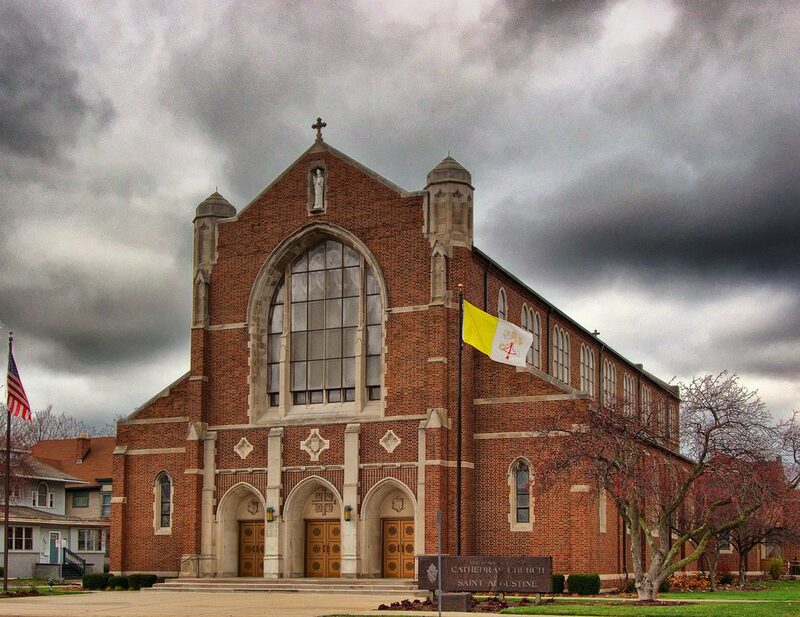 The second, is Kalamazoo, Michigan, which also had a young Catholic congregation in the same period. This article is prompted in part by a remark heard last year about anti-Catholic attitudes in the latter town. St. Bernard Church, Fitchburg, Mass. The last St. Bernard Church (with tall pointed spire), built in 1880 to replace the 1852 church. The first Catholic church in Fitchburg and northern Worcester County, Massachusetts was St. Bernard’s. 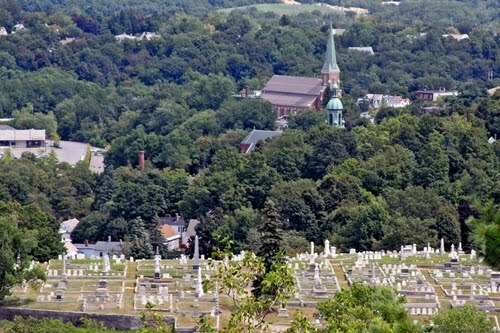 According to the parish history, a growing Catholic population in Fitchburg had to hold mass in the street in summer 1845, due to lack of a house of worship and being prohibited from using public buildings. In the US during this period – roughly 1840s to mid-1850s – there was both growing immigration of Catholics from Ireland and Germany, and a nativist, anti-Catholic, and anti-immigrant movement called the “Know Nothings.” For a brief time (1854-57) this group actually controlled the Massachusetts government. So, it is of interest that in Fitchburg at least, notables of the city who were evidently mostly (or all?) Protestants – among whom was my great3-grandfather Joseph Warren Mansur – assisted the local Catholic priest, Father Gibson, in the efforts he and his parishioners were making to obtain land and build a church. The Catholics were able to do this in 1848, but storm damage required them to rebuild in 1852, and it was that church that the then bishop of the Boston diocese, John Bernard Fitzpatrick, consecrated in that same year. Bishop Fitzpatrick and his delegation apparently stayed with J.W. Mansur (who at about that time was a Senator in the Massachusetts legislature) and family. All of this transpired, of course, before the electoral victories of the Know Nothings in 1854. While the apparent comity around the creation of St. Bernard’s tells us something about Fitchburg, one wonders whether these events could have played out similarly under a radically different Massachusetts government. J.W. Mansur’s wife, and my great3-grandmother, Anna Fitzpatrick (no known relation to the bishop) was Irish-born and evidently a Catholic. In a small way, perhaps, their marriage added another dimension to the Protestant-Catholic relations in Fitchburg of that era. St. Augustine Cathedral, Kalamazoo, Mich.
Fast forward to a summer 2018 visit to St. Augustine Cathedral in Kalamazoo, Michigan (which by coincidence also had a preceding smaller structure completed in 1852). I was seeking some specific information concerning the Mansur family, who moved there when J.W. bought the Kalamazoo Gazette in 1862. Although I did not find the particular information in Kalamazoo that thought I might (which itself was useful), one of the take-aways was an unexpected mention in conversation of prejudicial attitudes of some Protestants towards Catholics in local interfaith gatherings. As context, it turns out that the Kalamazoo area was not considered friendly to Catholics back when the first members of that confession settled in the area (c. 1830). Also, the Know-Nothing “American Party” was victorious in the 1856 elections in Kalamazoo (and some other locations in that region of Michigan). Inter-denominational prejudice & interfaith dialogue? One of the things I like about World Religion Day is the opportunity for people of different faiths to come together on an equal footing. Interfaith dialogue during the rest of the year is where the work gets done, I suppose, and maybe it is in those settings that residual and deeper prejudice might seep out. In any event, it was a bit jarring to hear of such attitudes between denominations, or towards one denomination, within one faith in the 21st century US. How common is this elsewhere in the country? The initial intent of this article was to highlight what seemed like the more positive story from Fitchburg in 1852, but I found that the more vexing issues raised in Kalamazoo, as well as the later ones in Massachusetts as a whole, belonged in the same discussion. So what does this say about the potential for ongoing dialogue among religions when even denominations may harbor negative attitudes? Of course we are aware that it was not that long ago that Northern Ireland had open conflict between Protestants and Catholics, and that in several countries, there is frequent violence between Sunnis and Shi’as, etc. So it is a measure of how much work there is to do for religious understanding more broadly. Also, I was coming at this from the viewpoint of genealogical research. That is the process that led to focus on these particular locations, and in the telling, it’s another thread to connect the two. Bringing it back to that point, I am wondering how Protestant attitudes towards Catholics in Kalamazoo (and perhaps the other way too) in the 1860s compared with those the Mansurs, as a denominationally mixed family, experienced in Fitchburg a few years earlier. J.W. Mansur sold the Gazette in 1865, after the end of the Civil War, and the Mansurs left Kalamazoo. The few cursory mentions of that portray it as a business decision, but was there more to the story?